online for this ESIC Kerala jobs is 15-04-2019. ESIC Kerala Recruitment will be through written exam and skill tests. 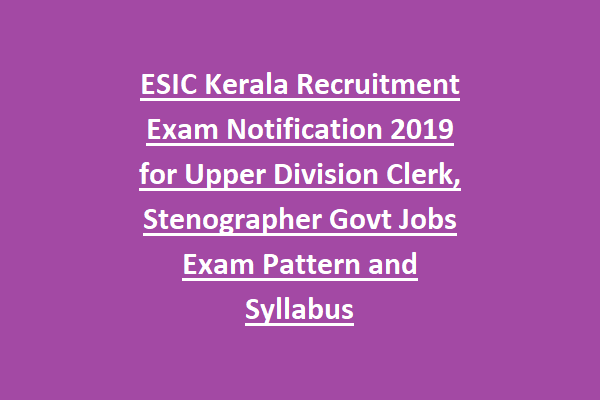 Exam pattern and Syllabus, age limits, qualifications and other details of ESIC Kerala Upper Division Clerk jobs recruitment is updated below. 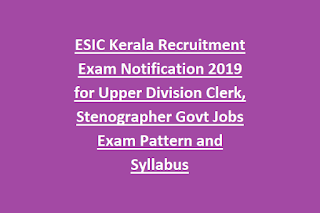 As on 15-04-2019 age limits for ESIC Kerala UDC, Stenographer jobs is 18-27 years. For Stenographer posts intermediate qualified candidates are eligible. For Upper Division Clerk posts degree qualifications is required. For Upper Division Clerk Posts selection will be held in 3 stages. Apply online for this ESIC Kerala jobs via official website of www.esic.nic.in. Last date to apply online for this KSIC Kerala Recruitment is 15-04-2019.